Wiltshire specialist manufacturer Avon Rubber has secured a contract worth up to $246m (£187m) with the US Department of Defense (DoD) to supply its latest protective masks. Melksham-based Avon, which makes respirators for military, homeland security and first responder customers as well as rubber products for the dairy industry, has developed the M53A1 mask, pictured, for the unique requirements of US special mission units. 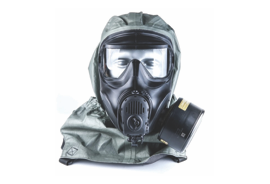 The deal, awarded to the group’s Avon Protection business, is a sole source contract to supply an undisclosed number of masks along with powered air systems and related accessories. The framework contract, which also covers additional Avon Protection products including its ST54 self-contained breathing apparatus, will run for up to seven years with a five-year base period plus two further one-year extensions. Avon Protection said it expected to receive the first order under the contract shortly, with deliveries expected to start in the second half of its current financial year, which ends on September 30. Avon Rubber chief executive officer Paul McDonald said: “This is another significant, multi-year contract for Avon Protection and demonstrates our ongoing focus on technological excellence and innovation leadership as we continue to deliver against our growth strategy. “Together with the M69 aircrew mask contract announced at the beginning of the year, this underpins our medium-term outlook and provides good visibility of revenues.